Bronson Market offers a convenient way for hospital staff, visitors and local community member to get fresh foods. Bronson Methodist Hospital converted a gift shop space into a market specializing in fresh foods so employees can have convenient access to affordable, healthy options. In early January, Bronson Methodist Hospital in Kalamazoo, Mich., debuted Bronson Market, a mini grocery store—it’s only about 800 square feet—in the medical office pavilion of its main hospital campus next to the outpatient testing area. That space, on the facility’s high-traffic first floor, is also adjacent to the seating area of the main cafeteria and thus highly visible. The market, occupying part of the footprint of a gift shop/pharmacy, sells an array of fresh foods ranging from fruits and vegetables to meats and dairy. It is part of Bronson’s food & nutrition department and benefits from its volume purchasing clout, so it can sell its products at very competitive prices to encourage purchases. The product mix includes healthy kinds of packaged foods and snacks, but little in the way of prepared foods, which can be found in the nearby hospital cafeteria. 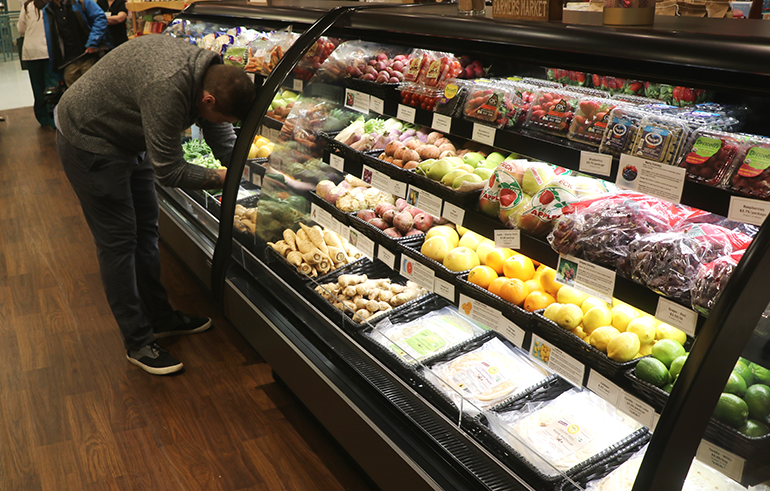 The notion of a grocery outlet that would specialize in fresh foods—the store has almost no prepared foods, as they are already available in the nearby cafeteria—also accorded with Bronson’s already advanced forays into promoting local sourcing. “At this point, about 45 percent of the food that we source as a hospital and serve both to our patients and in our retail areas is from local and regional farmers and producers,” Fletcher says proudly. “Southwest Michigan is actually the second most diverse agricultural community in the country. We have just an absolutely robust agricultural economy over here, so we are in a rather unique, fortunate position in sourcing food. The barriers we have run into over the years have been less about finding the food and more about creating the infrastructure” to get product from producer to end user. A big step in that direction came several years ago when Bronson partnered with the local community college, Kalamazoo Valley Community College (KVCC), to develop and open the KVCC Bronson Healthy Living Campus (HLC), a 13-acre complex located just across the street from Bronson Methodist that houses a Culinary and Allied Health school where students make connections between food, health and sustainability; KVCC’s Menus That Matter Culinary Arts and Sustainable Brewing programs complete with a student-run restaurant and café; a Food Innovation Center where KVCC students and partners explore new trends in growing food indoors and in reclaimed urban environments; and a food hub for aggregating foods from local farms to supply area hospitals—including Bronson—and other institutions such as schools. HLC also encompasses a greenhouse and outdoor gardens, a processing and distribution facility, a quality assurance testing lab and educational facilities. 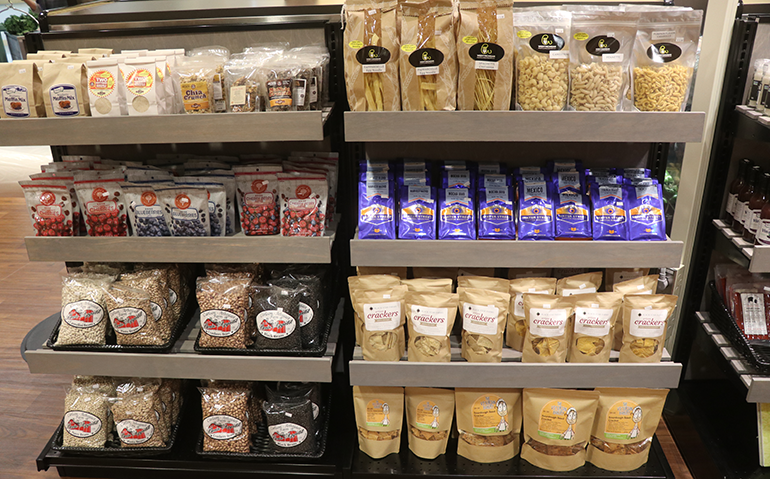 More than 50 of the products available in the Bronson Market are sourced through HLC’s Food Innovation Center. The vast majority of its produce—especially during the growing season—comes from local farmers and all of the meat sold is raised locally. A substantial amount of the fresh produce comes from local farmers, especially during the growing season, thanks to a food hub located just across the street. While the Kalamazoo area has a number of high-quality commercial grocery stores replete with fresh products, they are not immediately accessible to everyone, especially Bronson staff, so the minimarket inside the complex offers substantial savings in time and effort for them. And it’s not just the staff or even patients and their families who benefit. The presence of a conveniently located grocery outlet also fills a need for the surrounding area, which has lacked such an establishment. Daily customer counts over the first week and a half of the store’s opening have ranged from 150 to 200, with the counts slowly building as more people become aware of it,” Fletcher suggests, and the ones who have patronized it are very happy to have it.